The majority of domestic charcoal in the UK is imported sometimes at the cost of sensitive forest ecosystems from around the world. Coppice workers in the UK can produce the highest quality bar- b- q lump charcoal often using coppice wood which has no other use. To achieve the best results charcoal should be used as soon as possible after production, this helps prevent the charcoal absorbing moisture from the atmosphere. Bio-char is a fine grade charcoal which can be incorporated into compost as a soil improver helping to retain soil moisture and nutrients. Charcoal can remain stable within the soil over long periods and Interest in Bio-char is becoming more important as a method to lock away carbon from the atmosphere into the soil. A fine grade charcoal can be produced suitable for artists. 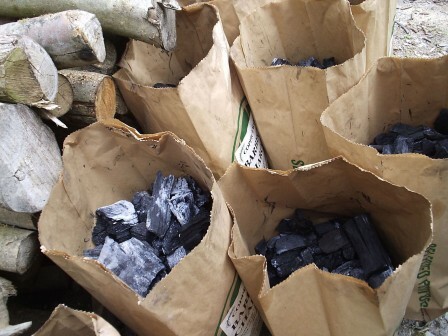 Different grades and sizes of charcoal can be produced and graded. Willow produces very good artist charcoal.